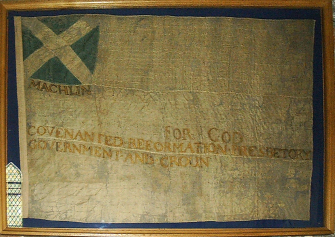 The Mauchline Covenanter Flag hangs inside Mauchline PArish Church, located in Loudoun Street, Mauchline. The church is open to the public on occasion - the best way of finding out when it is open is by looking at the Scotland's Churches Scheme for up-to-date opeing times. The Mauchline Covenanter Flag is a fairly typical Covenanter flag with the saltire in the hoist position, under which is the word 'Machlin', an early spelling of the village and parish name. FOR GOD, COVENANTED REFORMATION PRESBETORY GOVERNMENT AND CROUN.